The Buddha Myth--A Skeptic's Guide: WAS ASHOKA A BUDDHIST? Constantine was the Roman Ashoka. Diodotus I may have been Ashoka. Buddhists claim that King Ashoka (273-232 BCE) converted to Buddhism and propagated their faith, citing his pillars and rock edicts as evidence of this activity. In fact nowhere in these pillars and edicts is Buddhism ever mentioned, though he does mention dharma pretty often. But as John S. Strong says in The Legend of King Asoka, “Precisely what Ashoka meant by Dharma has been the subject of much debate. In Buddhist circles, the word means the Buddha’s Teachings—his doctrine—and it is thus widely supposed that this event marked Ashoka’s conversion to Buddhist faith. More generally, however, Dharma can be translated as law, duty, or righteousness, and as such it has many overtones in Indian religion. However he intended it, in his edicts, Ashoka seems to have been obsessed with Dharma. The Ashokan state was to be governed according to Dharma. The people were to follow Dharma. Wars of aggression were to be replaced by peaceful conquests of Dharma. Special royal ministers were charged with the propagation of Dharma. True delight in this world came only with delight in Dharma, and the old royal pleasure-tours and hunts were replaced by Dharma-pilgrimages. Map of Mauryan Empire at its height under Ashoka. "From these and other indications, we may say that Dharma seems to have meant for Ashoka a moral polity of active social concern, religious tolerance, ecological awareness, the observance of common ethical precepts, and the renunciation of war." 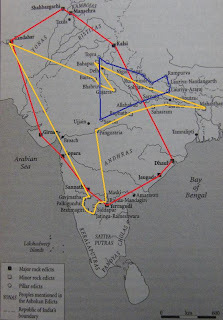 Map showing Ashoka's major rock edicts, (connected by red lines); minor rock edicts, (yellow lines); and pillar edicts, (blue lines). There is nothing wrong with such paeans of praise, Strong says, as long as it is clear that they reflect only a personal enthusiasm for the image of Ashoka presented in the edicts. When, however, it is implied that Buddhists the world over—“from the Volga to Japan”—must have admired Ashoka for the same reasons, then an objection must be sounded. Historically speaking, Buddhists the world over have known virtually nothing about the Ashoka-of-the-edicts. Instead, their enthusiasm for Ashoka was based almost entirely on the Buddhist legends that grew up around him. There is a very simple explanation for the predominance of the legends. Although the edicts were inscribed in the third century BCE,"the Brahmi script in which they were written was soon forgotten and it was only with its decipherment by James Princep in 1837 that the Ashoka-of-the-edicts came to the fore once again." "Thus speaks Ashoka, the Beloved of the Gods. For two and a half years I have been an open follower of the Buddha, though at first I did not make much progress. But for more than a year now I have drawn closer to the [Buddhist] Order, and have made much progress. In India the gods who formerly did not mix with men now do so. This is the result of effort, and may be obtained not only by the great, but even by the small, through effort—thus they may even easily win heaven. "Father and mother should be obeyed, teachers should be obeyed; pity…should be felt for all creatures. These virtues of Righteousness should be practiced… . This is an ancient rule, conducive to long life." "Piyadasi, King of Magadha, saluting the Sangha and wishing them good health and happiness, speaks thus: You know, reverend sirs, how great my faith in the Buddha, the Dharma and Sangha is. Whatever, reverend sirs, has been spoken by Lord Buddha, all that is well-spoken,. I consider it proper, reverend sirs, to advise on how the good Dharma should last long. "These Dharma texts -- Extracts from the Discipline, the Noble Way of Life, the Fears to Come, the Poem on the Silent Sage, the Discourse on the Pure Life, Upatisa's Questions, and the Advice to Rahula which was spoken by the Buddha concerning false speech -- these Dharma texts, reverend sirs, I desire that all the monks and nuns may constantly listen to and remember, . Likewise the laymen and laywomen. I have had this written that you may know my intentions." If these minor rock edicts are authentic and Ashoka does mention Buddha by name (even though Buddha is a title and not a name), then we have to concede that he was trying to promote Buddhism. But I’m skeptical as to the authenticity of these minor rock edicts. Why didn't Ashoka mention Buddha and Sangha on the major rock edicts or pillar edicts? The tradition that Ashoka actually became a Buddhist monk is now discredited. The inscriptions never mention the Buddha and show no awareness of his ‘Noble Eightfold Path’ or any other Buddhist schema. Even the idea of ‘conversion’ is suspect, since codes like those of the Buddhists and Jains were not seen as exclusive. Religion as creed, doctrine as dogma, and faith as truth are equations with little validity in pre-Islamic India. Most subscribed to the inexorable cycle of rebirth and to the notion that there were various ways of effecting eventual escape from it. The propitiation of a particular deity could help, but was more commonly a means of warding off disease and pestilence. Even brahmanical orthodoxy demanded no profession of faith, merely an acceptance of brahman authority and a high degree of caste conformity. There was indeed competition, especially amongst the heterodox sects, for adherents and for patronage. There was also ferocious debate which, on at least one occasion, required Ashoka’s intervention. But conversion, in the sense of renouncing one set of doctrines for another, was meaningless. To understand who Ashoka was, read this chapter from Buddhist India by T. W. Rhys Davids, published 1903. Davids was one of the early Buddhism scholars and the chapter gives us a picture of Ashoka before some later scholars began adding their own spin. Chandragupta, aided very largely by the previous organization of the great empire of Magadha, was able, once he had gained the mastery, not only to remain in possession for the long period of twenty-four years (about BCE 322—298), but to hand on the empire, with enlarged territory, to his son, Bindusara. Of him we know almost nothing. The Ceylon Chronicles merely say that he reigned for about twenty-eight years, and the Greeks, who call him Amitrochates (that is, Amitra-ghata, foe-destroyer, no doubt an official title), only tell us that Deimachos was sent to him as ambassador by Antiokhos, and Dionysios by Ptolemy Philadelphos. A few sentences from the pen of the former are still extant. When he died, about 270 BCE, he was succeeded by his son, Ashoka, then the Magadha viceroy at Ujjeni, of whom the Ceylon Chronicles and other Buddhist writings, and his own inscriptions, tell us so much. The Greeks do not mention him[very odd, considering Asoka's empire was the greatest empire of ancient India], and the Brahmin records completely ignore him until the time when, ten or twelve centuries afterwards, all danger of his influence had passed definitely away. They then go so far as to include his name among others in a list of kings. When this was done the authors of it had no access to the Buddhist writings, and could not read the inscriptions. It follows that the tradition had been carried down, all the time, in the Brahmin schools, though not one word about it had allowed to transpire. So Prinsep read the inscriptions. Building on the foundation he laid, we can read them better now. But we are not likely to forget the genial scholar whose noble life was sacrificed in the seemingly impossible task of laying those foundations. Now that we have the contemporary records in all their simplicity, and redolent of the time, the picturesque accounts, written six centuries or more afterwards, by well-meaning members of the Buddhist Order, who were thinking the while, not of historical criticism, but of religious edification, seem of poor account. It may be human to kick down the ladder by which one has just climbed up. But we need not do so, in this case, with too great violence. We may want it again. And it jars upon the reader to hear the Chronicles called the mendacious fictions of unscrupulous monks. Such expressions are inaccurate; and they show a grave want of appreciation of the points worth considering. Just as in the case of Megasthenes, or of the early English chronicles, so also in the case of the Ceylon chronicles it would be unreasonable to expect that sort of historical training which is of quite recent growth even in Europe. The Ceylon Chronicles would not suffer in comparison with the best of the Chronicles, even though so considerably later in date, written in England or France. The opinion of scholars as to the attitude to be adopted towards such works is quite unanimous. The hypothesis of deliberate lying, of conscious forgery, is generally discredited. What we find in such chronicles is not, indeed, sober history, as we should now understand the term, but neither is it pure fiction. It is good evidence of opinion as held at the time when it was written. [But it still doesn't make it true.] And from the fact that such an opinion was then held we can argue back, according to the circumstances of each case, to what was probably the opinion held at some earlier date. No hard words are needed: and we may be unfeignedly grateful to these old students and writers for having preserved as much as we can gather from their imperfect records. It may be asked, perhaps, why we do not try to save the intellectual effort necessary to balance probabilities in later accounts that cannot be entirely trusted, by confining ourselves exclusively to the contemporary documents, the inscriptions? The answer is that such a method would be absurd; it would not even save trouble. They give only a limited view of the set of circumstances they deal with. Royal proclamations, and official statements, are not usually regarded as telling the truth, the whole truth, and nothing but the truth. To put it mildly, there is an economy of candor in these documents, intensely interesting though they are. And they are enigmatic. It is not possible to understand them without the light thrown upon them by the later accounts. It would only add to their difficulty to reject, for instance, the identification of the Piyadassi of the inscriptions with the Ashoka of the literature, or the fact of his relationship to Chandragupta, or of his capital having been at Pataliputta, or any other of the numerous sidelights to be drawn from the Chronicles. (2). The Dipavamsa, in Pali, preserved in Burma. (3). Buddhaghosa's account in his commentry on the Vinaya. (4). The Mahavamsa, in Pali, preserved in Ceylon. Of these, the first was composed in the Ganges valley. The author and date are unknown; but it is probably as late as the third century of our era. It forms one of a collection of legends called Divyavadana. The exact force of this title is somewhat ambiguous. Avadana means a story, but as it is used exclusively of the life-story of a person distinguished in the religion, the collection corresponds to the Vitæ Sanctorum of the Christian Church. We know so little, as yet, of the literature of Buddhist Sanskrit that we cannot form any clear idea of the method by which the tradition it has preserved was handed down. It is otherwise with the other three. We know that there were two great monasteries at Anuradhapura in Ceylon, the Great Minster and the North Minister. There the canonical books were handed down, in Pali; and commentaries upon them, in Sinhalese, interspersed with mnemonic verses in Pali. In the third century of our era someone collected such of these Pali verses as referred to the history of Ceylon, piecing them together by other verses to make them a consecutive narrative. He called his poem, thus constructed, the Dipa-vamsa, the Island Chronicle. The old verses were atrocious Pali, and the new ones added are not much better. Then, as the old ones were taken, not from one commentary only, but from several, we get the same episode repeated in different verses. Added to this the work was supplanted in Ceylon by the much better-written book called the Maha-vamsa, or Great Chronicle; and was completely lost there. The present text, which is corrupt, has been restored, in the excellent edition by Professor Oldenberg, from MSS., all of which are derived from a single copy that had been preserved in Burma. Shortly after the Island Chronicle was composed, the celebrated Buddhaghosa, a Brahmin from Behar came over to Ceylon, and rewrote in Pali the old Sinhalese commentaries. His work supplanted the latter, which are now lost, and is the only evidence we have of the nature of the ancient tradition. He quotes, from the old Sinhalese commentary, a number of mnemonic verses also contained in the Island Chronicle, and gives us, in Pali, the substance of the Sinhalese prose with which they had originally been accompanied. A generation afterwards Mahanama wrote his great work, the Maha-vamsa. He was no historian, and had, besides the material used by his two predecessors, only popular legends to work on. But he was a literary artist, and his book is really an epic poem of remarkable merit, with the national idol, Dushta Gamini, the conqueror of the invading hosts of the Tamils, as its hero. What he says of other kings, and of Ashoka amongst them, is only by way of introduction, or of epilogue, to the main story. I have compared historically the various versions of one episode in these and other narratives (that of Ashoka and the Buddha relics), and have show how interesting are the results to be derived from that method. To retell such an episode in one’s own words may be a successful literary effort, but it would be of no historical value. It would give us merely a new version, and a version that had not been believed anywhere, at any time, in India. By the historical method, a few facts of importance may yet be gathered from amidst the poetical reveries of these later authors. So, for instance, the tradition—Indian of course in origin, but preserved in Nepal—states that Ashoka’s mother was the daughter of a Brahmin living in Champa. This may well be so. We hear nothing of his youth or early training. The Ceylon books all say that at the time of his father’s death he was holding the position of viceroy at Ujjeni, and that he had there married a local lady residing at Vedisa, afterwards the site of the celebrated building now known as the Sanchi Tope. They had two children, a son, Mahinda, and a daughter, Sanghamitta. But as this was really a misalliance, the lady being only of a merchant’s family, she was left behind when Ashoka left Ujjeni to go to Pataliputta and there secure the succession. All the accounts agree that this was no easy task. His elder brother, the viceroy of Takka-sila in the Panjab, opposed him, and it was only after a severe struggle, and not without bloodshed, including the death of his brother, that Ashoka made his way to the throne. The details of the struggle differ in the different stories, and there is a passing expression in one of the Edicts (all the more valuable because it is incidental) of brothers of the King being still alive well on in his reign. On the whole, I am inclined to believe that the tradition of a disputed succession is founded on fact. The Chronicles say that Ashoka was not formally anointed king till between the fourth and the fifth year after Bindusara’s death, and the language of the Edicts, which are dated, whenever they are dated, from the formal anointing, and not from the succession, would harmonize with this. Of the events of the first few years after Ashoka’s reign we have no information. In the ninth year a war broke out between Magadha and Kalinga, perhaps the then most powerful kingdom in India still independent of the empire ruled over by Ashoka. Of the rights and wrongs of the dispute we cannot judge. Our sole information comes from one side only, and is an incidental reference in the thirteenth Edict, published by Ashoka five years afterwards. In that document the King states that it was the remorse and pity that aroused in his mind by the horrors of the conquest—the killing, death by disease, and forcible carrying away of individuals, to which non-combatants and even peaceable Brahmins and recluses were exposed—that resulted in his conversion. He does not say to what. That, apparently, was supposed to be quite clear to anyone. It was sufficient to say that he had come to the opinion that the only true conquest was conquest by the religion (by the Dhamma). We are told, by the King himself, of three stages in his conversion. The Rupnath Edict is of about the same date as the last, but perhaps a little earlier, say the thirteenth year after his being formally anointed, or, as we should say, crowned—that is, in the seventeenth year after he became de jure the king. There he says that for two and a half years he had been a lay disciple (an upasaka), but had not developed much zeal; but one year before (before the date of the Edict) he had entered the Order, and begun to show greater zeal. Then in the eighth Rock Edict he declares that in the thirteenth year after his coronation he had set out for the Sambodhi--that is to say, he had set out, along the Aryan Eightfold Path, towards the attainment (if not in his present life then in some future birth as a man) of the state of mind called Arahatship. So in the ninth year of his reign an Upasaka, in the eleventh year a Bhikshu, in the thirteenth, still reaching upward, he enters the Path. This is his own account of the matter, and he gives no one else any credit for his progress. It is not by any suggestion or instruction, received either from layman or recluse, that he has adopted this course. It is his own doing throughout. The Chronicles profess to know the name of the bhikshu who was instrumental in his conversion. I am not prepared to say, though their evidence is so much later, that there may not be some truth in their view. It is quite true that it is sound Buddhist doctrine that each man is “to be a lamp unto himself, to hold fast as a refuge to the truth [the Dhamma], to look not for refuge to any one besides himself.” But it is so very likely that one factor at least in the King’s change of heart may have been the exhortation or conversation of one or other of the Arahats, that we may suppose both accounts to have been right. It is strange for a king, whether in India or in Europe, to devote himself strenuously to the higher life at all. It is doubly strange that, in doing so, he should select a system of belief where salvation, independent of any belief in a soul, lay in self-conquest. No ordinary man would have so behaved; and the result must have been due mainly to his own character, his firmness of purpose, his strong individuality. But he was quite incapable of inventing the system. We know it had existed long before. And it is not probable that those who had already trained themselves in it were wholly without influence upon him. Henceforward he devoted his great energy, and the powerful resources of his wide empire to the realization of his new ideals. To that end all his edicts were published, all the changes he made in the administration of his empire were directed, and enormous sums were lavished in the erection of costly buildings in aid of the new faith. It is characteristic that he says not a word of these last. To his mind it was apparently the teaching that was so much the most important thing that it swallowed up every other consideration. But the unanimous testimony of all the later traditions, confirmed as it is by the actual remains discovered, leaves no doubt upon the point. It is true that no building erected by Ashoka remains intact above ground, but an inscription of his has been found at Sanchi, and it is the unanimous opinion of scholars that he built the first temple at Bodh Gaya. Sanchi, the old name of which is Chetiya Giri (the Hill with the Shrine upon it); must have been a famous place before Ashoka went to Ujjeni. There are no less than eleven topes on the plateau at the top of the hill. Some of them were opened in 1822 and the rest in 1851. At the second excavation one of the smaller ones was found to contain part of the ashes from the funeral pyres of Sariputta and Moggallana, two of the Buddha’s principal disciples. The village Vedisa, where Ashoka made the acquaintance of his first wife, lies close by, and the tops of other hills in the neighborhood are also crowned with stupas. The person in whose honor the largest tope was built has not been discovered, as the relic box within it could not be found. 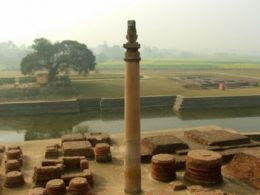 But a large number of inscriptions in characters of the Ashoka period have been found on the pillars and railing surrounding it. And General Cunningham was of opinion that, while this tope itself, like the other topes on the plateau, was older and the gateways younger than Ashoka’s time, the Buddhist railing round it belonged to his reign. But it is by no means impossible that the gateways also should be ascribed to Ashoka. And, in any case,the remains at Sanchi may be fairly used to give us an idea of the kind of building that was likely to be put up by Ashoka’s command, and has played so great a part in the history of Buddhist India. The whole site is now a desolate ruin; and no attempt has yet been made to give, in drawing, a restoration of how it must have appeared in the days of its early beauty. But the annexed illustrations show the present appearance of the principal tope, and some of the details of the surrounding sculptures. And a portion of the railing round Bharahat [Bharhut] is added for the sake of comparison. At Bodh Gaya, on the other hand, though it is known that Ashoka built the original temple, it has been so often changed, and added to, that only a few fragments of railing, and probably the very remarkable sinhasana, or throne, remain of the work done in his time. The present building has been restored, as a national monument, by order of the English Government. It will be noticed how different it is in outline from the ancient form, as how in the illustration of the Sanchi Tope. This is due to a difference of ideal. The ancient tope was an enlarged and glorified circular burial mound. The later ones imitate an ordinary dwelling-hut, the outline of which was determined by the natural bend of two bamboos, planted apart in the ground, and drawn together at the top. This shape is characteristic of all medieval temples in India, and an illustration of the Jain temple at Khujarao is annexed, as one of the best examples of this style. But to return to Ashoka’s own doings. The Edicts hitherto discovered are thirty-four in number. We know of others seen in the seventh century, and we know, approximately, the sites on which they were seen—such, for instance, as those at Savatthi and Ramagama—and there must be others besides. Further discoveries, therefore, may be confidently anticipated. Of those now known two are merely commemorative proclamations recording visits paid by Ashoka—one to the stupa erected over the funeral urn of Konagamana the Buddha, and one to the birthplace of Gotama the Buddha. Three others are merely short dedications of certain caves to the use of the Ajivakas, a body of ascetic recluses often mentioned in the Buddhist canonical books. The remainder are so many tracts, short proclamations on stone, published with the view of propagating the Dhamma, or of explaining the methods adopted by the Emperor to that end. The word “Dhamma” has given, and will always give, great trouble to the translators. It connotes or involves, so much. Etymologically it is identical with the Latin word forma; and the way in which it came to be used as it was in India, in Ashoka’s time, is well illustrated by the history of our own colloquialism “good form.” Dhamma has been rendered Law. But it never has any one of the various senses attached to the word “law” in English. It means rather, when used in this connection, that which it is “good form” to do in accord with established custom. So it never means exactly religion, but rather, when used in that connection, what it behoves a man of right feeling to do—or, on the other hand, what a man of sense will naturally hold. It lies quite apart from all questions either of ritual or of theology. On such Dhamma the Brahmins, as such, did not then even pose as authorities. But it was the main subject of thought and discussion among the Wanderers, and to them the people looked up as teachers of the Dhamma. And while, on the other hand, the Dhamma was common property to them all, was Indian rather than Buddhist, yet, on the other hand, the people we now call Buddhists (they did not call themselves so) were concerned so exclusively with the Dhamma, apart from ritual or theology, that their doctrine was called the Dhamma. It fell, naturally, for them into three divisions, quite distinct one from the other—the theory of what it was right (good form) for the layman (the upasaka) to do and to be, of what it was right for the Wanderer (the Pabbajita) to do and to be; and thirdly, what the men or women, whether laity or Wanderers, who had entered the Path to Arahatship, should do, and be, and know. On each of these three points their views, amidst much that was identical with those generally held, contained also, in many details, things peculiar to themselves alone. Now the Dhamma promulgated by Ashoka was the first, only, of these three divisions. It was the Dhamma for laymen, as generally held in India, but in the form, and with the modifications, adopted by the Buddhists. The curious thing about this Dhamma, as a description of the whole duty of man, of the good layman, is—especially when we consider its date—its extraordinary simplicity. This is, historically, so very interesting, that it will be worthwhile to set it out in full. 1. No animal may be slaughtered for sacrifice. 2. Tribal feasts in high places are not to be celebrated. 3. Docility to parents is good. 4. Liberality to friends, acquaintances and relatives, and to Brahmins and recluses is good. 5. Not to injure living beings is good. 6. Economy in expenditure, and avoiding disputes, is good. 7. Self-mastery is always possible and excellent even for the man who is too poor to be able to give largely. 8. Purity of heart is always possible and excellent even for the man who is too poor to be able to give largely. 9. Gratitude is always possible and excellent even for the man who is too poor to be able to give largely. 10. Fidelity is always possible and excellent even for the man who is too poor to be able to give largely. ROCK EDICTS NOS. 9 & 11. 12. Toleration. Honor should be paid to all, laymen and recluses alike, belonging to other sects. No one should disparage other sects to exalt his own. Self-restraint in words is the right thing. And let a man seek rather after the growth in his own sect of the essence of the matter. 13. The Dhamma is good. But what is the Dhamma? The having but little, in one’s own mind, of the Intoxications; doing many benefits to others; compassion; liberality; truth; purity. That is all. There is not a word about God or the soul, not a word about Buddha or Buddhism. The appeal is made, in apparent confidence that the statements are self-evident, to all the subjects of the empire. Under what conditions would such a state of things have been possible? Had there been then anything new or strange in this view of life (which now seems so strange to a European reader) there would haved been phrases in the Edicts striving to meet the natural objection that must certainly have arisen. There is nothing of the king. It follows that the doctrine, as an ideal, must have been already widely accepted, though men did not always act up to it. It is exactly as if, in a country already Christian, the king should issue proclamations calling on the people, in this point or in that, to act up to recognize the ideal of the Christian life. Ashoka, precisely as in the parallel case of Constantine, embraced a cause so far successful that it seemed on the verge of victory. And it is not at all unlikely that reasons of state may have had their share in influencing Ashoka, just as they certainly did in the case of Constantine. It was not only within the boundaries of his own empire that Ashoka tried to spread the Dhamma. In the thirteenth Edict, in about 225 BCE, addressed to his sons and grandsons, after declaring that he himself found pleasure rather in conquests by the Dhamma than in conquests by the sword, he says he had already made such conquests in the realms of the kings of Syria, Egypt, Macedonia, Epirus, and Kyrene, among the Cholas and Pandyas in South India, in Ceylon, and among a number of peoples dwelling in the borders of his empire. "Everywhere” he adds, “men conform to the instructions of the King as regards the Dhamma; and even where the emissaries of the King go not, there, when they have heard of the King’s Dhamma, the folk conform themselves, and will conform themselves, to the duties of the Dhamma, that dyke against… [here the context is lost]. It is difficult to say how much of this is mere royal rhodomontade. It is quite likely that the Greek kings are only thrown in by way of makeweight, as it were; and that no emissaries had been actually sent there at all. Even had they been sent, there is little reason to believe that the Greek self-complacency would have been much disturbed. Ashoka’s estimate of the results obtained is better evidence of his own vanity than it is of Greek docility. We may imagine the Greek amusement at the absurd idea of a “barbarian” teaching them their duty; but we can scarcely imagine them discarding their gods and their superstitions at the bidding of an alien king. Here, fortunately, the Chronicles come to our assistance. In a curt record they give us the names of missionaries sent out by Tissa, the son of Moggali (the author of the Katha Vatthu, and the president of the 3rd Council held in Ashoka’s reign and under his patronage). They were sent to Kashmir, to Gandhara, to the Himalaya (Nepal or Tibet), to the border lands on the Indus, to the coast of Burma, to South India and Ceylon. Each party consisted of a leader and four assistants. Of the five missionaries to the Himalaya region three are named as Majjhima, Kassapa-gotta, and Dunmdubhissara. Many of the Topes had been opened, in search of treasure, and the urns in them ruthlessly destroyed, before the archeologists examined them; so the evidence is incomplete. Even as it stands the evidence of the old characters on those preserved to us will be estimated in different ways by different minds. With these, and similar facts before them, some still consider the literature as a tissue of mendacious fictions; others still consider that the Buddha is only a sun myth, and his disciples merely stars. I must humbly confess myself unable to follow speculations so bold. The Ceylon scholars knew, of course, nothing of these long-buried inscriptions; and could not have read or understood them, even had they access to them. What we have to explain is how they came, centuries afterwards, to record precisely the same names in precisely the same connection. It is only the wildest credulity that could ascribe this to chance. And, dull as it may seem, I see no better explanation than the very simple one that these men really went as missionary teachers to the Himalaya region, and that the fact that they had done so was handed down, in unbroken tradition, till the Chroniclers put it down for us. The Chronicles thus not only confirm but also supplement Ashoka’s information about the missions. And when we find that they ascribe the sending out of the missionaries, not to Ashoka, but to the leaders of the Order, and that they make no mention of any such missions to the Greek kingdoms in the distant West, is at least probable that the views they take is more accurate, in these respects, than the official proclamations. So Ashoka mentions a mission to Ceylon. But it is his mission. No credit is given to anyone except himself. He merely says it was successful, and gives no details. As we might expect, the Chroniclers of the island give names and details, which they work up into a picturesque and edifying legend. Its central incident is the transplanting to Ceylon of a branch of the tree at Bodh Gaya under which the Buddha had achieved enlightenment. Now this event is portrayed on two curious bas-reliefs on the Eastern Gateway at Sanchi, which must be nearly as old as the event itself. In the middle of the lower picture is the Bodhi Tree, as it stood at Gaya, with Ashoka’s chapel rising halfway up the tree. A precession with musicians is on both sides of it. To the right a royal person, perhaps Ashoka, is getting down from his horse by the aid of a dwarf. In the upper right picture there is a small Bodhi tree in a pot, and again a great procession, with to the left a city, perhaps Anuradhapura, perhaps Tamralipti, to which the young tree was taken before it went to Ceylon. 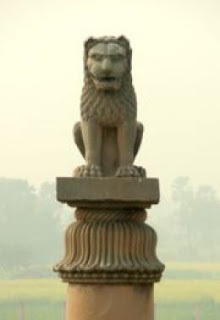 The decorations on either side of the lower bas-relief are peacocks, symbolical of Ashoka’s family, the Moriyas (the Peacock); and lions, symbolical of Ceylon, or the royal family of Ceylon (that is, of Simhala, the Lion island). Opinions may differ as to the meaning of some of the details, but there can be no doubt as to the main subject. It was a great event, an impressive state ceremony, and a fitting climax to that one of the missionary efforts of Ashoka’s reign which was most pregnant of results. For there, in that beautiful island, the province most fruitful of any in India or its confines in continuous and successful literary work and effort, there have never been wanting, from that day to this, the requisite number of earnest scholars and students to keep alive, and hand down to their successors, and to us, that invaluable literature which has taught us much of the history of religion, not only in Ceylon, but also in India itself. 1. The appointment of functionaries in charge of districts and provinces to instruct the people. 2. The putting up of pillars of the Dhamma (that is, pillars with the Edicts inscribed on them), and the appointment of special ministers at the court to superintend the propagation of the Dhamma. 3. The planting of trees for shade, and the digging of wells, at short intervals, along the roads. 4. The appointment of special ministers to superintend charities to both householders and Wanderers, and to regulate the affairs of the Order, and of other sects having jurisdiction apart from the ordinary magistrates. 5. The Appointment of these and other officers to superintend the distribution of the charities of the Queen and their children. He claims by these means to have had great success in promoting the Dhamma (as set out above), and adds that such positive regulations as he has made are of small account compared with the change of disposition which he has been able to bring about; and that, above all, his own example will lead people to adopt his teachings. Anyone who knows Indian feeling will be amazed at the boldness of this program. That the king should appoint Lord High Almoners or Charity Commissioners to look after his own gifts would offend none. That these officials should be required to look into the manner in which the great people at court disbursed their charities and report if they went wrong (wrong, that is, from the king’s point of view), would be unpopular enough in any case, but doubly so when his point of view was what it was. That the king should settle disputes, when brought before him or his court, between members of the various Orders, was right enough. That he should arrogate to himself to look after their private concerns was quite another matter. That he should hold a certain set of opinions, and be bent on propagating them, was comfortable to those that held the same. That he should ignore everyone else, even on his own side, and give out that he was the teacher, and that the Dhamma was his Dhamma, would be accepted, of course; but with a shrug, suggestive that much allowance must be made for the self-complacency of kings. That he failed was no wonder. The set of opinions he favored with his patronage was enfeebled and corrupted by his favor. With all his evident desire to do the very best possible things, and always to be open to the appeals of the subjects he looked upon as his children, he left his empire in such a condition that it soon disintegrated and crumbled away. He made the boast (vain boast) that the Brahmins, who claimed to be gods upon the earth, had, by his efforts, ceased to be so regarded, and he himself committed the irreparable of imagining himself to be adeus ex machine, able and ready to put all things and all men straight. Yet, in spite of all, he surely remains one of the most striking and interesting personalities in the history of the world. There is a personal touch in the Edicts which cannot be ignored. The language must be his own. No minister would have dared to put such confessions and such professions into the mouth of so masterful a master. The language is rugged, uncouth, involved, full of repetitions, reminding us often of the mannerisms of the speeches of Cromwell. And the preoccupation with himself, his opinions, his example, his good deeds, amounts almost to megalomania. But how sane the grasp of things most difficult to grasp! How simple, how true, how tolerant, his view of conduct and of life! How free from all the superstitions that dominated so many minds, then as now, in East and West alike! It was not his own view, it is true, quite as much as he makes out. But he had made it his own, and was keen to bring others to know it. To realize what this means, one may consider how many of the Greek princes in all the vast domains which had once formed the empire of Alexander were intellectually capable of rising to the same height. Unless it be maintained that the general average of intelligence in such things was higher then in India than in Greece it seems difficult to avoid the conclusion that Ashoka must have been a man of quite exceptional natural ability. The style of his Edicts, on the other hand, is scarcely compatible with much intellectual culture or training. His early years were apparently otherwise occupied. But his long reign is a sign of physical vigor; and of his strong will and moral earnestness, even to the point of self-control, there can be no question. Those who think Indian affairs should be looked at through the spectacles of medieval Brahmins can never forgive him for having made light of the priests, and the gods, and the superstitious ceremonies of the day. But the gospel he preached was as applicable to the India of that day as it would be to India now. That he was wanting in the most efficient sort of practical statesmanship seems to have been chiefly due to the glamour of his high position, of a majesty that was, indeed (and we should never forget this), so very splendid that it was great enough to blind the eyes of most. The culture of a Marcus Aurelius or an Akbar might have saved him from this. But even as it was, it is, among European rulers, with Marcus Aurelius for some things, with Cromwell for others, that he deserves to be compared. That is no slight praise, and had Ashoka been greater than he was he would not have attempted the impossible. We should have had no Edicts. And we should probably know little of the personality of the most remarkable, the most imposing, figure among the native princes of India. Worst kind of bogus science. I say this without being a buddhist.